The young earth creationism perspective is the result of a plain, or historical-grammatical reading of the description of the early earth in the Bible, or the Islamic Qur'an, which both contain nearly parallel accounts of a six-day creation, Adam and Eve in the garden of Eden, and Noah's flood. For purposes that are clear, the Christian interpretation will be built upon and described. The arguments put by proponents for a young Earth fall into the following categories. Scriptural: The Biblical account is written as actual history, and is therefore to be understood as such. Theological: The Biblical doctrines rely on the creation and flood accounts being actual history. Scientific: The scientific evidence fits better with a young Earth than an old Earth. 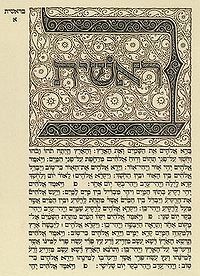 The Hebrew book of Genesis, Chapter 1. Young Earth creationists argue that the Bible was written as actual history and was to be understood as such. With this view, the Bible clearly teaches a young Earth. The Bible specifically states that the time from the beginning of the cosmos to the creation of humans was six days as recorded in Genesis 1, and that the time from the creation of man to the birth of Abraham was approximately 1950 years, as recorded in the Biblical genealogies. Given Biblical and other data for calculating a date for Abraham, we can calculate that the universe and the Earth were created approximately 6000 years ago. The Bible states in Genesis 1 that the earth with all its inhabitants was created by God in 6 days. Although many people argue that the days of creation should not be taken literally, the events are described in terms that are correlated with definitions of specific lengths of time. Since God created time and language, it is reasonable to assume that the most straight forward reading of these passages should take place. The specificity of the period of time in question is made clear and reinforced on numerous occasions with the phrase "And there was evening, and there was morning". In Exodus 20:8-11 God tells the Israelites to keep the seventh day, the Sabbath, holy. The reason provided (v.11) is that God created the universe in six days, and rested on the seventh. It is argued that the analogy would be a dis-analogy if the days in the Genesis Creation Account were not also literal days. This idea is repeated in Exodus 31:15-17. Further support lies with how the word "Day" is used elsewhere in scripture. In every instance where a day is described in the Bible using this terminology outside of Genesis, it always means an ordinary day. Based on a plain reading of Genesis, the flood of Noah describes a global event that destroyed all terrestrial life on Earth except for those brought on board the ark. Assuming this event happened as described, the young earth creationism perspective holds that the fossil record is the result of this flood. This geologic interpretation known as catastrophism was a long-standing view of fossiliferous rocks prior to the 1800s when a uniformitarian view began to take hold. When Jesus was asked about divorce, he quoted from Genesis on the origin of marriage, mentioning that God made them male and female at the beginning of creation Mark 10:6. In the old-Earth timescale, the origin of mankind occurred in the last couple of million years of the 14-billion-year age of the universe. However, in the Young Earth timescale, mankind was created six days after the creation of the known universe, truly "at the beginning of creation". Jesus spoke of Noah as a literal, historical person as described in Scripture Matthew 24:37-38 , and Abraham John 8:58 , and Lot in the historical Sodom Luke 17:28-29 in context of his own return. Jesus appealed to the writings of Moses to confirm his own identity John 5:46 , purpose Luke 16:31 , and mission Luke 24:27 , as did his disciples Acts 28:23 . Paul the Apostle used the Creation as a basis for evangelism to those without any Hebrew foundation Acts 17:24 and claimed that the Cross "alone" was "foolishness" to such people I Corinthians 1:23 and the resurrection "alone" is meaningless to those who don't accept the writings of Moses Luke 16:31 . Ultimately angels declare that the Creation event alone is the "everlasting gospel" Revelation 14:6-7 . Many churches teach only the Crucifixion and Resurrection as "the Gospel" but it is clear from the primary doctrinal threads of Christ's teachings that the "full Gospel" is comprised of four primary events: Creation, Fall, Crucifixion and Resurrection, and Christ's own explanations require the Creation and Fall to explain the meaning of the Crucifixion and Resurrection. Without the foundation of a literal six-day creation, quite a few Biblical doctrines found in the Old and New Testaments have no basis. At the end of each day of creation, "God saw that it was good". At the end of the sixth day, with creation now complete, "God saw all that he had made, and it was very good." Genesis 1:31 Death was introduced as a punishment for Adam's sin. Genesis 3:19,_22-24 "The last enemy to be destroyed is death." 1 Corinthians 15:26 Only the young Earth view allows for no death before Adam. All old-age views place the fossil record—with its record of death and suffering—prior to Adam, thus proposing that death is a part of God's "very good" creation and not a punishment for mankind's sin, but a natural part of existence. 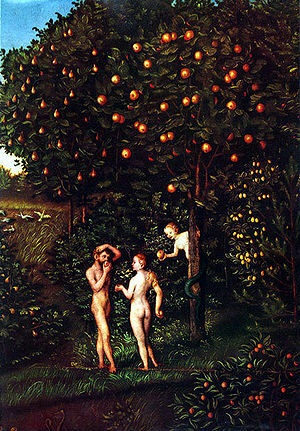 God created Eve to be Adam's companion. She was created from his own body, therefore they were of one flesh.Genesis 2:21-24 Jesus teaches that when a man and woman marry, they are also "one flesh". Mark10:6-8, Matthew 19:4,5 Jesus refers to the Genesis passage as real history, and in fact the validity of his argument depends on it. It also implies that humans were created "in the beginning," whereas evolutionary theories put man relatively late in the timeline of the universe. Young earth creation scientists advance a number of arguments in support of a recent creation, arguments that place an upper limit on the age of the Earth, solar system, or universe. Many objections to claims of an extremely old age for the earth and the universe have also been put forth. For example, Russell Humphreys' argument based on the amount of salt in the ocean is designed to show the maximum possible age of the oceans based on uniformitarian assumptions, and thus shows that the oceans could not be as old as claimed; it is not designed to show the actual age of the oceans, and as such the resulting age, although far too great for the young Earth view, is not inconsistent with it. The RATE group led a collaborative research initiative between the Institute for Creation Research and the Creation Research Society to investigate problems with radiometric dating. Young earth creationists also argue that paleontologists have so far failed to identify the transitional forms that the theory of evolution requires. There are over one hundred million identified and cataloged fossils currently in the world's museums. If the theory of evolution is true, then there should be transitional forms in the fossil record that show the intermediate life forms. Another term for these "transitional forms" is "missing links". Geomagnetic field decay - Observations made of the strength of Earth's magnetic field over the last 150 years show that it is decaying, which puts an upper limit on the age of the Earth. Pleochroic halos - Scars of radioactive decay, which suggest problems with the standard uniformitarian model. Helium diffusion - there is a significant amount of helium still inside the zircons, showing their ages to be 6000 +/- 2000 years. Accelerated Nuclear Decay - Recent experiments commissioned by the RATE group indicate that "1.5 billion years" worth of nuclear decay has taken place, but in one or more short periods 4000 - 8000 years ago. This would shrink the alleged 4.5 billion year radioisotope age of the earth to only a few thousand years. Ocean salinity - Water runoff brings salts into the sea, which is not removed by evaporation. Based on the current rate of salt accumulation into the ocean it has been estimated that the oceans were 80–90 million years old at the most. Young earth creationists believe that the universe was created by God, and reject naturalistic explanations on the origins of the galaxies, stars, and planets. In addition, young earth creationist scientists contest the Big Bang Theory stating that the theory is scientifically unsound. Creation scientists also point out that the Big Bang theory has had many dissenters including the British astronomer Sir Fred Hoyle, the Nobel Prize winner Hannes Alfven, and astronomers Geoffrey Burbidge and Halton Arp. In 2004, an "Open Letter to the Scientific Community" disputing the Big Bang theory was signed by 33 leading scientists has been published on the internet and in the science journal New Scientist. The dissent letter has subsequently been signed by hundreds of individuals around the world. See the following for more arguments that that support a young universe. The theory of a young solar system has many scientific arguments that can be used to show consistency with the belief in a recent creation. Some simply put an upper limit on the age of solar system. For example, evidence has indicated that there is too much interplanetary dust in the solar system. The solar wind, solar gravitation and the Poynting-Robertson effect remove dust from the solar system, while comets and asteroids can contribute to the dust. An argument was issued by Robertson and Slusher in a 100 page monograph confirming that equations derived nearly fifty years earlier were essentially correct and the solar system was limited to a few thousand years without some hitherto unknown massive replacement method. At least half of this conclusion is supported by secular scientists who hold that the lifespan for a typical dust particle is about 10,000 years. See the following for more arguments that support a young solar system. Helioseismology - The core of the sun produces deuterium from hydrogen fusion at 5 million degrees K. The heat is transferred from the core by convection currents so it could reach surface in days, not a million years. It also leads to an age for the sun based on the deuterium/hydrogen ratio of the local interstellar medium of 6,000-12,857 years. Institute for Creation Research headquarters in Dallas, Texas. Roughly 47% of the United States population believes man was created by God pretty much in his present form less than 10,000 years ago and this number has stayed roughly constant for the last 20 years. Young Earth Creationism is most commonly found among members of the Abrahamic faiths, especially Judaism, Christianity, and Islam. Most young earth creationists believe that most of the book of Genesis (including the creation accounts) is a straightforward narrative meant to be understood literally. The following are the leading young Earth creationist ministries worldwide. Traditionally, Judaism supported young earth creationism. In addition, a majority of the early church fathers supported the young earth creationist view. While Young Earth Creationism is prominent in many conservative Protestant denominations, theologically liberal Protestant and Jewish denominations generally reject it. The post-Vatican II Roman Catholic Church has a cautiously positive view of the theory of evolution, while the majority of traditionalist Catholics strongly support the view of a young earth and a literal creation. —but in 2005 Cardinal Christoph Schönborn, Archbishop of Vienna, said that he found evidence of design in nature and that attempts to ignore such evidence amounted to an abdication of the intellect. Orthodox Judaism currently has diverse opinions regarding young earth creationism. Ultra-Orthodox Judaism accepts young earth creationism. Atheists do not believe in young earth creationism. While agnostics do not believe in young earth creationism there have been some notable statements of skepticism regarding the theory of evolution from agnostics. On the other hand, Charles Darwin and Thomas Huxley both staunch proponents of the theory of evolution stated that they were agnostics. ↑ ‘Young’ age of the Earth & Universe Q&A (Answers in Genesis). ↑ 5.0 5.1 Astronomy and Astrophysics Questions and Answers (Answers in Genesis). ↑ ‘Young’ age of the Earth & Universe Q&A (Creation Ministries International). ↑ Baumgardner, John, Genesis Flood 28 July 2003. ↑ Polystrate Fossils and the Creation/Evolution Controversy by Joe Deweese and Bert Thompson, Ph.D. Apologetics Press :: Reason & Revelation, 20:93-95 December 2000. ↑ Sarfati, Jonathan Salty seas: Evidence for a young earth Creation 21(1):16–17 December 1998. ↑ Thompson, Bert, Harrub, Brad, and May, Branyon The Big Bang Theory—A Scientific Critique Apologetics Press, May 2003 - 23:32-34,36-47. ↑ Brown, Walt, 2001, Big Bang? ↑ Grigg, Russell, Should Genesis be taken literally? Creation 16(1):38–41, December 1993. ↑ James-Griffiths, James,Creation days and Orthodox Jewish tradition Creation 26(2):53–55, March 2004. ↑ Bradshaw, Robert I., Creationism & the Early Church, chapter 3, The Days of Genesis 1. ↑ Morris, Henry, Old-Earth Creationism Back to Genesis April 1997. ↑ What Conservative Protestants Believe (beliefnet). ↑ Jarvik, Elaine, Beliefs on Darwin's evolution vary from religion to religion Deseret Morning News, January 19, 2006. ↑ Pope praises science but stresses evolution not proven USA Today, Updated 4/12/2007. ↑ Heneghan, Tom, Catholics and Evolution: Interview with Cardinal Christoph Schönborn (beliefnet). ↑ Schönborn, Christoph, Finding Design in Nature, The New York Times, July 7, 2005. Retrieved November 28, 2007. ↑ Rabbinical Council of America, Creation, Evolution, and Intelligent Design. ↑ Winnick, Pamela R.,Evolutionary War Toledo City Paper, March 7, 2002. ↑ Batten, Don, A Who’s Who of evolutionists Creation 20(1):32 December 1997. ↑ Woodward, Thomas E., Doubts About Darwin (Apologetics Press). ↑ Agnostic Philosopher Caught in Conspiracy to Question Darwinism Evolution News & Views, (Discovery Institute). ↑ Darwin's slippery slide into unbelief by John M. Brentnall and Russell M. Grigg. Creation 18(1):34–37, December 1995. How old is the earth? First published in Refuting Evolution, Chapter 8 by Dr. Jonathan Sarfati. Evidence for a Young World by Russell Humphreys Ph.D. ICR IMPACT No. 384. June 2005. The ‘days’ of creation in Genesis 1: Literal ‘days’ or figurative ‘periods/epochs’ of time? by Hasel, G.F. Origins 21(1):5–38. 1994. (defends literal days). A Defense of Literal Days in the Creation Week (PDF) by McCabe, R.V. Detroit Baptist Seminary Journal 5:97–123. 2000. Naming the animals: all in a day’s work for Adam by Russell Grigg, Creation Vol. 18 No. 4, September 1996. Byzantine Creation Era at OrthodoxWiki. This page was last modified on 24 November 2015, at 15:11.